This post contains affiliate links. They are marked with a *. When it came time for 2019 and my new Cousin, I wanted to leave my old one in this cover. I also realised I didn’t need all these pockets. Again, the planner just sits on my desk all day and I’m not one for ‘decorating pockets’. So, I went without a cover for a couple of months. One day I happened to close the Cousin and noticed how tatty the cardboard cover was starting to look. I realised I needed to find a cover, asap! The cover on cover for the Hobonichi Weeks is the perfect planner cover. A pen loop, a couple of pockets and a method to keep it closed if you need it to. 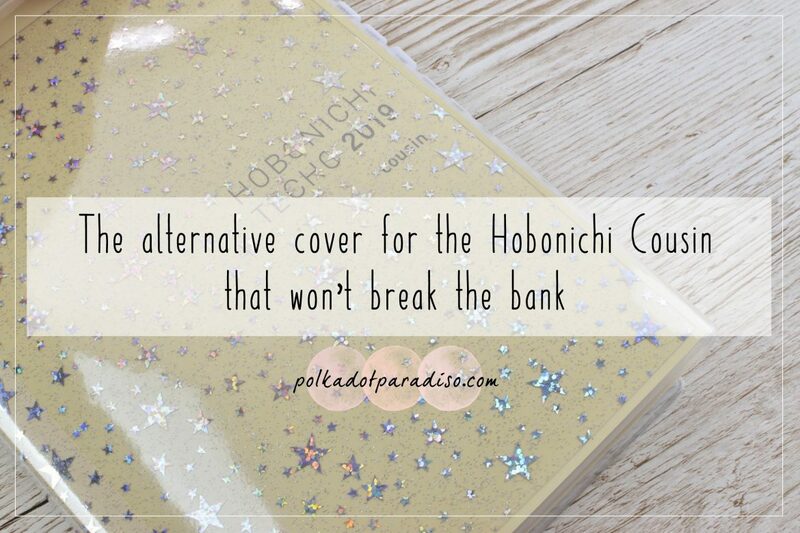 Sadly, the cover on cover for the Hobonichi Cousin is intended to fit around one of the bigger covers. If you want something similar, you have to look to other brands. I found this one* from Midori. Pretty cheap at just £5 with free delivery. No pockets but it does come with a pen loop. It’s quite a small loop though so sadly didn’t fit my fountain pen. The first thing I noticed on putting the Cousin in this was how it needed a bit of stretching. This cover isn’t made for thick A5 notebooks so it won’t necessarily keep closed without some training (I’m planning on a big stack of books). As jelly covers are the in thing I decided to order some of the ‘jelly fabric‘* to create my own using this cover. Unfortunately, I didn’t pay attention to the size of the sheet and it’s a bit small! You can find bigger pieces from other sellers* though. At the moment I’m still debating whether to order some larger jelly for this. I quite like the simple look without anything in it to be honest. However, because of the design of the cover you could put anything in there really. You can switch out different papers or cardstocks as the season changes. I’ve got some vellum from Papermania in there at the moment. Just a watch out though – you need something slightly taller than A4 to fully fit in the cover. If you are someone who travels around with your Cousin this may not be the cover for you, primarily because it has no closure system. You would need to buy something like a Rivet Band* to do that. If it’s just going to live on your desk though, and you just want some extra protection, this is perfect.